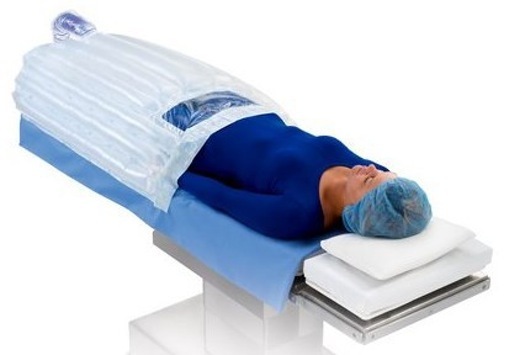 The 3M Bair Hugger is a blanket device that is used to keep body temperatures warm for patients undergoing surgery. The device works by pushing warm air through a tube like device into a blanket that is placed over a patient. Recently, the 3m Bair Hugger has been under fire due to concerns about airborne contaminant recirculation resulting in infection over open surgical sites. Types of infections include Methicillin-resistant Staphylococcus aureus (MRSA) antibiotics resistant bacterium that can be difficult to treat. Another infection includes Sepsis, a life threatening bacteria that can cause damage to the blood stream. Patients undergoing knee and hip replacement surgery while using the body warming device are primarily at risk of infections deep in the joint. Complications from these infections include hospitalization, serious inflammation, implant revision surgery, limited mobility, permanent disability, amputation and death. Dr. Scott Augustine the inventor of the body warming device, has spoken out about the potential dangers of his invention and says that manufacturing of the device should be discontinued due to bacteria in airborne contaminants that can circulate in the forced air system of the device and can cause serious infection to patients undergoing surgery. Patients undergoing hip and knee replacements commonly use Bair Hugger devices. If infection is caused to the open sites of the patients surgeries, it could cause serious complications deep in their joints. This may result in the removal of the implant, the implantation of a new joint and intensive treatment. An example of a lawsuit that has been filed against the 3M Company and Arizant Inc. Some patients who have used the Bair Hugger Device during surgery have developed Methicillin-resistant Staphylococcus aureus (MRSA). MRSA is an antibiotic resistant bacterium that is difficult to treat. It can lead to serious infection result in amputation. Suffered Injury or Infection from Bair Hugger Blanket? If you or a loved one has suffered from a catastrophic infection or other type of serious illness as a result of using the 3M Bair Hugger surgical blanket, it may be in your best interests to consult with a qualified personal injury attorney. Davis Law Group has helped injury victims recover the compensation they deserve under the law for more than 20 years and our case investigation team is standing by to discuss your claim 24/7. Our award-winning legal team will review your case free of charge and help you better understand your legal rights and options for recovery. Just use the contact form on this page to get started and we'll contact you shortly.